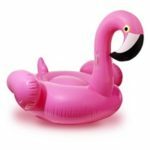 Outdo other holidaymakers this summer by showing up with the coolest giant inflatable pool toy. 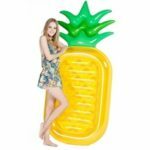 Taking a giant inflatable pool float to the swimming pool or beach has become increasingly popular, perhaps due to the various cool designs to choose from. Let’s be honest though, who wouldn’t want to lounge on a giant unicorn, flamingo or pizza slice drifting in whatever direction the water takes you. 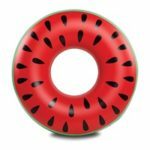 These cool inflatable pool toys are for adults and children above a certain age, but it’s not suitable for small children as they can fall off. Children should be supervised at all times and even wear armbands in case they fall off. For small children there are kids inflatable pool toys which are more children friendly. For example, this inflatable smiling gecko is much cheaper and smaller so it’s easier for a child to handle. When these inflatable pool toys are deflated, they won’t take up much room in your luggage which makes them perfect for holidays. Some can also be inflated using the cold air from a hairdryer! But for others you’ll have to use a hand pump or blow it up using your mouth if you have enough oxygen in your lungs. 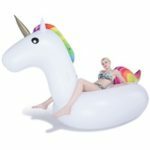 Although most people would choose a giant inflatable pool float accordingly to their favourite style, however there might be certain functions or features one will offer which might make you reconsider. 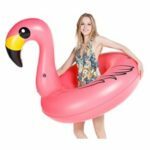 There also could be two or three styles you can’t decide between, therefore we’ll list the features to look out for so you can choose the best inflatable pool float. User capacity – Some will be big enough to fit two adults, but this also does depend on the size of the person and how you’re relaxing on the float. If you’re lying down then there might not be enough room for another person but if you’re sitting up you can even fit three adults. Inflated dimensions – The dimensions once it’s inflated will perhaps give you a better indication of how large it is and how many people you can fit on the float. 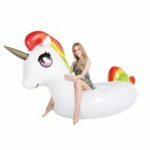 Bear in mind that with some floats such as a unicorn pool float, the length will include the tail and head as well rather than the body area which you can sit on. 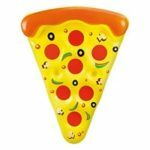 Handles – Allows you to hold onto something when getting on or off, you can also hold onto it when you’re on the float for balance or to prevent you from falling off. 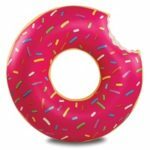 Cup holder – Will securely hold your drink without it spilling, without a cup holder you’ll have to try to balance it somewhere on the float but the chances are it’ll probably get knocked over. Alternatively, you can buy a separately inflatable drink holder if your inflatable pool float doesn’t come with one. Extras – Since rips, holes and punctures can happen with inflatable floats, some will come with a patch kit to repair it if any mishaps occur.